How does Night Vision Rifle Scope work? Have you ever wished to own a scope with the ability to see around at night as spies in Hollywood movie? Night vision rifle scope is the solution for you. In this article, we will help you know more about night vision technology and how to find the best night vision rifle scope. Night vision rifle scope works by collecting the small amount of ambient light available (for example, light from stars and infrared light). And then it will amplify it until the image can be seen with the naked eye. Night vision rifle scope has four main parts that help to collect and amplify the existing light. They are glasses, eyepieces, power supplies and cathode ray tube. The images that you see are not from the scope, but they are amplified on a phosphorous screen. The understanding performance of four generations will help you pick the best night vision rifle scope. – Generation 1: Compared to the original one which was used in Second World War, this generation of night vision is improved. In details, they no longer use infrared lights, instead use natural light from the moon or stars. This also means that these devices will be completely useless on nights without moon or cloudy. And with the use of cathode and anode to accelerate electrons, image quality and durability remain a big problem for these devices. – Generation 2: This is a step forward in the development of night vision technology. Image quality and durability far outweigh the first generation. However, the most remarkable achievement is the ability to observe under extremely limited lighting conditions. This improvement is due to the addition of the microchannel plate. The microchannel helps to increase the number of electrons (instead of their speed as the first generation), and it makes the image much clearer. – Generation 3: In general, there are not many improvements compared to 2nd generation. It is remanufactured with the material mainly gallium arsenide, and this material is very effective in transferring energy from photons to electrons. Also, the microchannel plates are coated with a layer of ion, so the life expectancy of the amplifiers is significantly improved. – Generation 4: The interesting improvement of these devices is the removal of third-generation enhancements. In fact, although adding a layer of the ion to the microchannel improves the durability of nigh vision, image quality is worse. Without this layer, the image becomes less blur and brighter. Normally, night vision binoculars cannot be used during the day because the sunlight will immediately burn the image amplifier tube. However, digital night vision allows you use in both day and night. Thanks to the principle of operation based on electromagnetic waves, you can easily store images on the memory card. Therefore, instead of just observing, scopes also act as a digital recorder for recording images and sounds. Night vision rifle scopes usually have different magnifications. This means your viewing distance depends on both the magnification of the lens and the quality of the image amplifier tube. If you want to look at big distances, you should choose higher magnification scopes (which mean a higher generation). IR Illumination generates infrared light that is invisible to our naked eyes. Thus, it ensures that you can see in the severe weather condition at night such as fog, mist, rain, and snowfall. The number of times the light amplifier amplifies the light can be shown by high gain settings. In the first generation, this is 300-900 times. In the second generation or later, this is from 20,000 to 30,000 times. High-end night vision with more functions and better image quality will come in handy with a higher price. – $0-$200: basic functions for new learners. – $200 – $500: weatherproof casing and more sturdy build, more accurate adjustments. 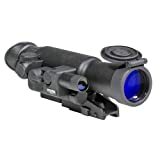 – Over $1500: best night vision rifle scope with amazing magnification range and great adjustments. As mentioned above, with night vision rifle scopes, you won’t experience image deformation on the screen or blurry images. Ergonomics design will provide more comfort when using night vision, especially for a long time. It also ensures your proper move and helps you aim better. The materials of night vision rifle scope will ensure the useful life of this device. The best option is titanium body. It keeps the scope in perfect shape for a long time as well as the stable operation for the night vision. When talking about digital night vision rifle scope, you may think about cumbrous scopes with the high price, which is just suitable for military or spices. In fact, Sightmark has proven that low price doesn’t mean bad quality. This digital night vision is lighter than other common scopes and also long eye relief. Therefore, you can feel comfortable to use for a long time. 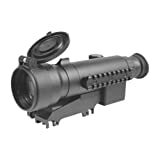 Sightmark offers various IR illuminators in which you can turn off the IR or have three different infrared intensities. It’s undeniable that distance is an importance factor to perfect aim. Armasight Nemesis is designed especially for long range shooting, with 6x magnification. Also, the detachable IR Illuminator will ensure you to see objects during the night and at long distance. Auto bright control will also make it easier for you to see targets through the scope’s lens. Made of titanium, Fairfield is lightweight and also durable to ensure you can feel comfortable to use for a long time under outdoor hash conditions. Also, it offers high-quality image resolution so that you can see your target easily and clearly in the dark. If you just need to use the scope at night only, Fairfield will be the perfect choice for you. ATN offer a wide range of accessories compared to other scopes. You can record your hunting experience into 1080p and store or transfer to your iPhone or laptop in no time at all. ATN is not just night vision rifle scope; it can be used in daylight too. Now you can enjoy your hunting expedition anytime. Yukon is easy and comfortable to use thanks to the internal focusing ability and ergonomic design. With the weaver rail, you can attach the scope with different accessories such as laser pointer or IR flashlight. Also, Yukon is lightweight but strong and made of titanium. Hence, it will ensure both perfect experience and long useful life. Night vision technology sounds like utopian but is real. Night vision has been increasingly used in both military and civilian, for reconnaissance purposes and everyday tasks. 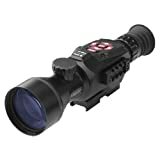 You need to consider your demand and compare different products to pick the best night vision rifle scope for yourself.